A busy & varied day of computer repair work for Horncastle Computer Services. We thought it would be good to share a busy and very varied day of work from last week for Horncastle Computer Services. The day started with a trip to Minting to drop back an iPad who’s screen we replaced. Coming back towards Horncastle via Hemingby we checked out an issue with a MacBook Pro screen. It turned out the graphics chip was causing the system to crash soon after booting, so we took the details needed to research how much a repair/replacement logic board would cost to be able to get back to the customer later. Returning back to base was the next port of call to continue two jobs. Inside a laptop you can see the copper heatsink and system fan. First was backing up; wiping; reinstalling a fresh copy of Windows; setting up drivers, setting up necessary and useful programs; and finally restoring user data. We do this job all the time and it takes a lot of time to complete, but it’s worthwhile because the user gets their computer working as well as it possibly can (without a hardware upgrade), and we can be sure the computer is completely clean and working so the customer won’t be coming back with an issue we somehow otherwise could have missed. 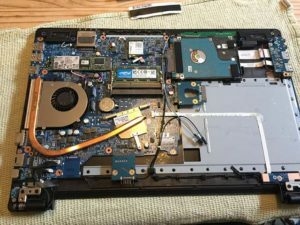 Second was changing the system fan on an ageing Sony Vaio laptop. The machine sounded like it was taking off – the ball bearings on the machine had worn out. We changed the fan, applied new thermal paste between the processor and heatsink and also cleaned the heatsink grill so it was free from dust and grime. After putting it all back together and switching it back on the system sounded almost silent compared to before. In the afternoon, there was another three callouts. The first was fixing ‘no Internet’ which turned out to be a problem with the network configuration on a desktop PC. It took some sorting but the job was done within the hour was done and the customer satisfied. Next job we had was in Woodhall Spa with a customer we have been out to several times before. They wanted their ‘passwords sorting out’ – meaning, in this case, to change all their different passwords to just one they have to remember. We do not recommend doing this, especially if the new password is short, made of dictionary words and/or easily guessable, but we also understand there has to be a balance between security and ease of use. We discussed all of this with the customer and followed their instructions to change all the passwords they could remember (Amazon, eBay, Apple, Microsoft, BT account, BT email, TomTom, Samsung, Google, Argos, Spotify, EON and some others we can remember). I feel happy the customer is able to put in this amount of trust in me to do this – it’s not something I would ever recommend unless you trust the person. The process took just over an hour involving speaking to an apple representative to unlock their account and other complications for what should usually be a simple password reset process for any service…I think the customer realised it would have taken them far long and caused them significant stress too. 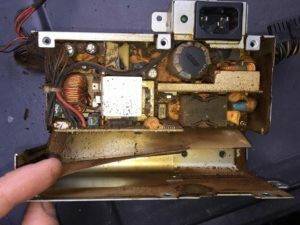 Inside a small desktop PC power supply unit. Very dirty and not cooling right! Next we went to Tattershall for an old favourite job of speeding up a Windows Vista machine (don’t get to do many Vista machines these days). The machine was used for business and was required to run only two programs – upgrading wasn’t practical because the license for one of the programs required to run on a new machine would have cost £1200! The machine was in constant use except for about the only 2 hour window possible today so a callout was required. The machine was in such a slow state, but we managed to get it useable again for £70 and the customer was happy with saving all that money. We also informed them that if things start to fail on the computer it would still be possible avoid the £1200 cost by replacing parts rather than getting a whole new machine (If a computer is not used for the internet it’s perfectly acceptable to keep it on an outdated operating system). We returned back to base for a customer to drop off a laptop for a screen replacement; another to drop off a desktop PC for a physical internal clean; and for the customers to pick up the two machines we were working on earlier. It was a long day but satisfying being able to help so many people.